These days, it's not at all easy to get on to the set of Doctor Who and details of forthcoming stories are zealously guarded. But when the series was made at BBC Television Centre in London things were very different – as my chum Paul Condon explains. "Above each of the studios at TVC there's the main gallery where the producer and director sit," says Paul. "But there's also a public viewing gallery, where people going on tours round the building can observe what's going on and BBC staff can see what other programmes are being recorded." Staff could also sign guests into the building – as happened with Paul in 1989. "A friend of mine from the Merseyside local group [of Doctor Who fans] had just moved to London and got a job working at the BBC," he says. This friend offered Paul – then aged 18 – the chance to watch Doctor Who being recorded. "It was the first time I'd ever been to London without my family, and probably only the second or third time I'd been to London full stop. It was very exciting." Paul's friend wasn't the only one offering access to the viewing gallery, as Paul found when he got there. "Over the course of the day, maybe a dozen people came in and out." Who were they? "I didn't really know the old guard of fandom, so I don't know. I didn't recognise them." There was no direct contact between the viewing gallery and the production team on the show – Paul and the others could watch proceedings in the studio but not get in anyone's way. "But there's a sound feed so we could hear everything going on," he says. "There were monitors set up as well so we had the feed from the cameras." And what could Paul and the other fans see? "I hope my memory of the day hasn't let me down on too many of the details. The viewing gallery is probably about 70 or 80 feet up from the floor, so it's a high vantage point. You get to see pretty much the entire studio floor beneath you, looking down into the sets, through the roofs of the rooms that have been laid out." Paul visited on 3 August 1989 and saw the final day of recording on Ghost Light – in which the Doctor (Sylvester McCoy) takes his friend Ace (Sophie Aldred) to a haunted house in the 1880s. Did the Victorian sets look impressive? "Oh gosh yes. I couldn't believe that they'd managed to get that main staircase set in there. It looked incredible – and big. From our high angle, we couldn't get a very good view of most of it because the walls of the set were so high. There were a couple of scenes – stuff in Josiah's living room, pulling the drawer out with Inspector Mackenzie in it – that we couldn't see at all so we were relying on the monitors. But it looked absolutely lovely." What was the atmosphere like in the viewing gallery as they watched? "Very hushed, very excited," he says. "People who'd been to recordings before were more nonchalant – you could tell the really excited ones were there for the first time, with wide-eyed saucer eyes. But there was a lot of excitement whenever we heard a new bit of dialogue or they moved to a new set or scene." So what did Paul see being recorded? "Lots of the sequences in the main hall. Things like Mrs Grose opening and locking the doors, and welcoming people in – all that stuff from right at the beginning of part one." "But I think the day was really being used more for practical effects and stuff. There were a lot of retakes of Sharon Duce as Control jumping through the glass and escaping from that room. I also saw that brilliant sequence where Sophie has the flashback, with all the cockroaches and creepy- crawlies, and the police light on her while Mrs Pritchard looms up behind." "Actually, there was a fantastic scene that got cut, with Mrs Pritchard going after Ace and pulling out a machete from under her skirt! It looked almost Carry On – presumably that's why they cut it. But yeah, we saw lots from each of the episodes. They were bouncing round the story quite a lot." Did that make it difficult to follow the plot? "I had very little idea what the hell was going on. 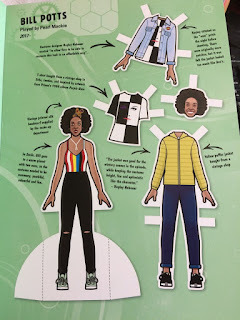 But when I got back from it I wrote a little article for the Southport Doctor Who club, full of teasers and hints about what to expect, as if I did!" How long was Paul there in the viewing gallery? "To start, I probably had about an hour and a half. Then we went to the BBC Club, had a bite to eat and a drink, and went back for a bit more." 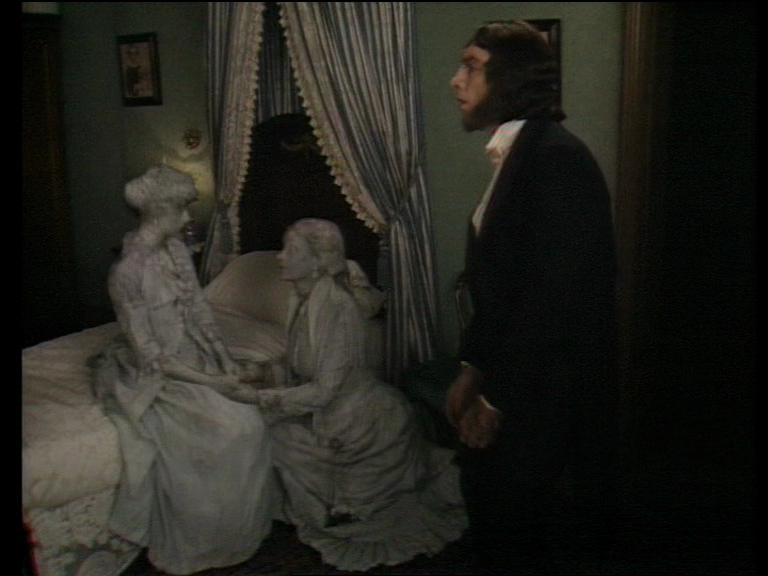 He was there to see the shot of Mrs Pritchard and Gwendoline being turned to stone. "There was a lot of stuff with cameras being reset at different angles so that the actual petrification effect was done pretty much live in camera with an electronic overlay over it." It was the last shot of the day, and of that year's Doctor Who. "Some of the cast and crew went to the bar but we didn't hang around," says Paul. "We'd been there all afternoon, I'd seen what the BBC Club looked like and my mate wanted to go home. It was the end of a working day for him. I hoped I'd be able to come back again the next year and see more. But, well..."
As it turned out, Ghost Light wasn't merely the last Doctor Who story to be recorded in 1989 (though not the last to be broadcast). It was also the last television Doctor Who story to be made until 1996, the last to be made in the UK until 2004 and the last to be made at BBC Television Centre ever. Paul didn't suspect the series was about to be axed as he left TV Centre that night. "No one did at all at that point. There may have been whispers going around the production team but certainly as fans we had no idea." 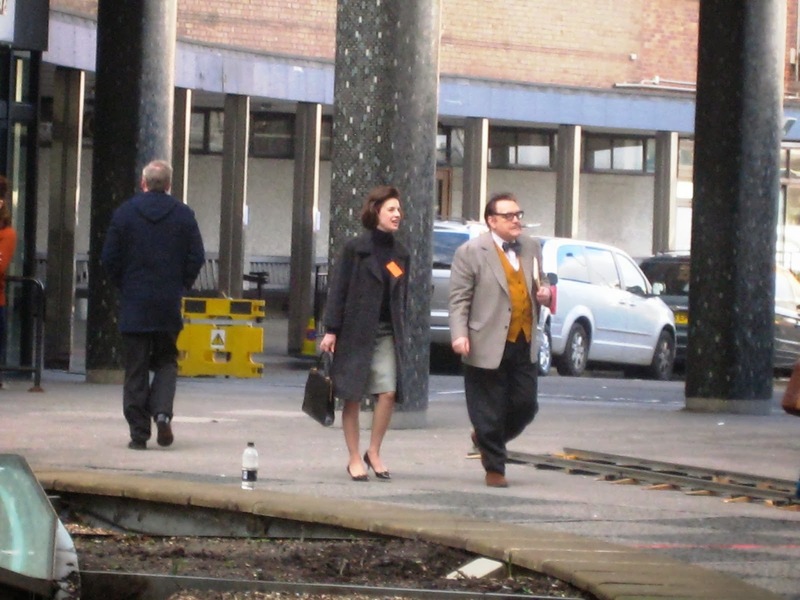 Doctor Who may have left TV Centre for the last time, but Paul ended up working there. "Yes, for the last three years of its existence, when the Entertainment department was in there. I'd often take friends on tours round the building and show them places used in Doctor Who, like the entrance to the World Ecology Bureau [in The Seeds of Doom] that's really just a door into the studios. I'd give them a tour through all the public viewing galleries to see what was on. They'd usually gasp at how high up it is, and how big and empty those spaces are when there's nothing in them. It took me back to the first time I saw them." As Paul says, when he took me for a tour in late 2010, many of the studios stood empty and unused. Earlier this year, TV Centre closed for the last time. Paul sighs. "My department moved out into one of the new buildings where The One Show is filmed. About two weeks before Television Centre closed, I took part in a staff recreation of the Roy Castle tap dancing routine. Ridiculous! But, you know... 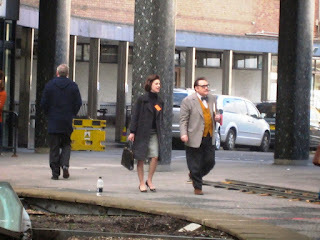 It was one of the last things filmed at TVC." "And then, a week before it closed, I was going into a meeting there. There was hardly anything left. But as I was coming in, there was a camera crew in the concrete doughnut. I thought, 'What on earth are they filming now?' I looked over to the left, and there was Mark Gatiss with the biggest grin on his face. Bloody Doctor Who was filming! It was for An Adventure in Space and Time, with Verity Lambert, Sydney Newman and Carole Ann Ford, on the reactions as they arrived. That was the perfect goodbye to TVC for me. It was literally the last time I went into the building."